I signed up for Twitter almost a year ago to the day. I had heard of Twitter, of course, but I connected the medium to such messages as “I am so bored of this life!” and “I just drank an entire six-pack in five minutes.” Mind you, life can be boring at times (although Twitter is a fine antidote, I find) and I am known throughout the world for my firm handling of the six-pack. There was little, however, that could tempt me to join the league of “two-thumb typers”. Then I became elected to The Young Academy, the “junior” branch of the Royal Dutch Academy of Arts and Sciences, and saw how Twitter can be a marvelous tool to present your research interests to a broader audience, both inside and outside academia. I decided to give it a try for a year and then evaluate. As I started to write such an evaluation for this blog, another dynamic appeared, which I will give voice as well: how did I become “@erik_kwakkel”? 0-250 Followers – What I love most about Twitter is how it connects you to like-minded individuals, kindred spirits if you want. I enjoy reading what others have to share, and I love it when followers express that they enjoyed something I posted, for example through their replies or retweets – the latter being the perfect litmus test for assessing how well you are “in touch” with your followers. Mind you, when I started tweeting there was little feedback. Not just because I had few followers (on Twitter everybody is forced to talk to himself for a little while upon start-up), but also because I had not found my niche yet. I felt like an echo because I was merely retweeting others, including Calls for Papers, blogs about medieval manuscripts, new findings in my field of research – the study of the medieval book. 250-500 Followers – During the first weeks that I merely echoed others I remaining very indifferent about Twitter. That changed in March 2012, when my students and I discovered dozens of medieval fragments while staying in a monastery (more on this event here, here and here). Over the course of three days I live-tweeted our findings. Mind you, I did not decide to live-tweet, because I had never even heard of it. I merely aimed to show others what we discovered. Since we found something new every 15 minutes, the event started to attract attention among the 250 followers I then had. Many things happened: their number increased quickly; I started to receive responses from others about our findings, including identifications; the newspaper called; and I began to enjoy tweeting. These three days were important because it gave me a sense of Twitter’s potential, but also that it was possible to have a dialogue with others interested in old books. I realized, in sum, that one can make a real contribution to a virtual community. 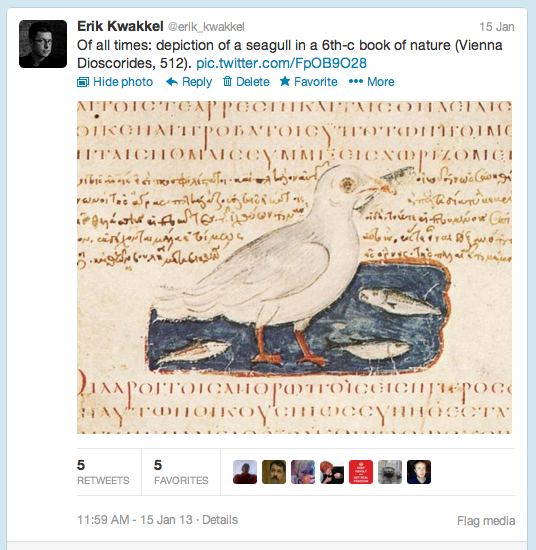 500-1000 Followers – It is kind of ironic that I learned to make sense of Twitter while staying in a medieval monastery. It also shows that being secluded from the world has no impact on your contribution to Twitter, which is another thing I have grown to like about the medium. A second boost caught me equally by surprise. The afternoon before I went on holiday, early July 2012, I had an hour to kill. I thought I would send out a bunch of images because I did not know when I would be able to tweet again. 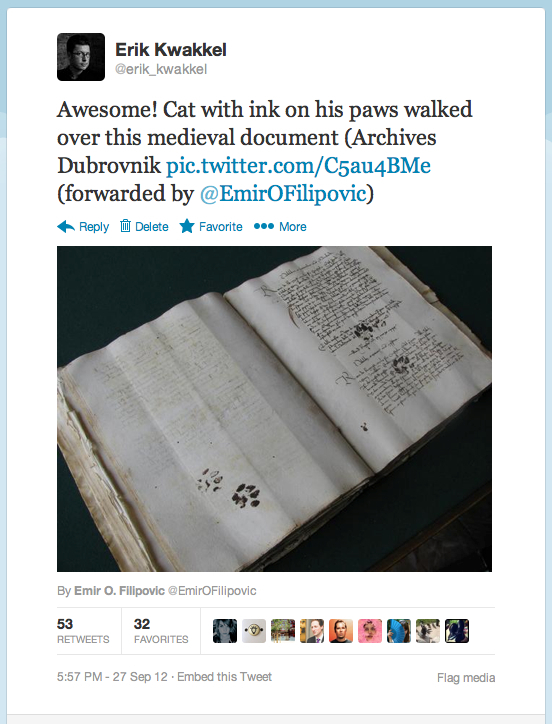 By this time I tweeted a few images per week, mostly of manuscripts I encountered in libraries, both virtual and real. That hour I sent out ten manuscript pages with doodles that I had found. However, I changed one thing, although not purposefully so. Whereas my captions normally merely stated the shelfmark and the age of the manuscript, I found myself typing funny, even bizarre and over-the-top things to accompany the image (here is one of those ten). Blame it on the lure of the holiday, which was around the corner, but I’d never had so much fun as a twitterer. The responses were very unexpected: I received dozens of retweets within half an hour; people were asking for more; and others responded by sending doodles they had discovered themselves. 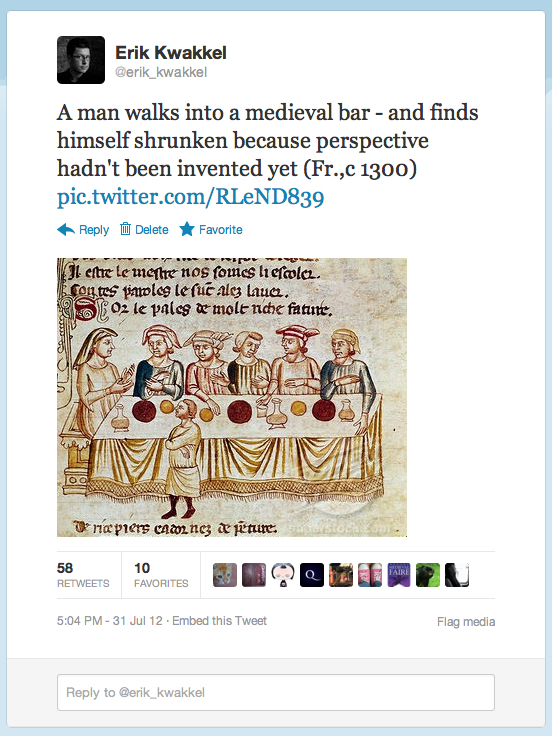 1000-1500 Followers – That one hour in July changed everything for me. The ten medieval doodles showed me a way to combine three important things: what I love as a researcher (medieval books); the means to reach a broad audience (images); and something that is dear to me personally, which is to bring a light touch, humor if appropriate, to all things I do. In effect, the ten images helped me to decide who I wanted to be as @erik_kwakkel: an expert who shows off the wonderful world of the medieval book through images with vivid, funny where possible, captions. During my summer holiday I remained “in the zone” and experimented with various types of captions and images, leaning in particular on the responses from some of the new followers I had gained (such as @PaulaSKirby). Did they retweet, then it worked. If not, I had gone too far. I learned that four images per day saturates the market. Also that early in the day over-the-top tweets have less impact than the more factual ones. And so I crafted a schedule that starts with a factual tweet (Noon, my time); followed by a funny one (4 pm); then a tweet that is a mix of these two (8 pm); and finally a neutral one (Midnight). 1668 Followers – So here I am: @erik_kwakkel, tweeting four images per day to 1668 (correction, now 1670) followers, interspersed with announcements, links to remarkable blogs, or manuscript news. From time to time I post material sent to me by others, such as the cat paw image above. My network has grown exponentially, not just virtually, but also tangibly: I received tweets with invitations to speak; some of my own tweets led to articles in national newspapers; and at conferences I often know a few delegates already, through Twitter. The “fun” dynamic of my tweets has even sparked a well thought-through analysis from @burnablebooks, from which I learned new things about my image stream (find it here). There are many seemingly appealing reasons not to be on Twitter as an academic (I blogged about them here), but none have persuaded me to leave the medium be. I will stick around, as I hope my followers will too.